We were so glad to receive your very interesting letter the other day. I hope you aren’t working yourself to death. I wish I could help you. We are still having a “lovely” time. The more I sail the more I like it. Miss Bertha said that Cousin Margaret and I and she herself were the ones that enjoyed sailing most. It is so interesting because it employs both the mind and arms. You have to hold the tiller and the sheet rope, the rope that holds the sail, one in each hand and at the same time watch the sail and judge what to do with the tiller and sheet rope. Jessie and Nellie are not quite so fond of it as I am. They would rather play. I suppose they have told you about the little house they have built against the sand doone. One day we went bathing in the bay. I tried to see how far I could swim and succeeded in swimming quite far. Will said that I swam distances which put him out of breath. He said that he thought I could beat him swimming by the end of the summer. Of course that is nonsense but I think it shows that I have improved some. I still get headaches when I read; so we have all decided that I had better not read at all for the rest of the summer and so give my eyes an entire rest. If I don't read I have very few headaches and they are not bad. Everybody is so kind to me in offering to read to me. I am reading Middlemarch with Jessie and Oedipus with Will. Jessie, and Nellie, Pauline, and I are going to read Annias Lee together. I finnished Adam Bede sometime ago. Isn’t it interesting! The eye tooth I told you about is nearly in place; so I suppose I will be going to Phila. soon again. I went up to Phila the other day to have the gold band put on again. 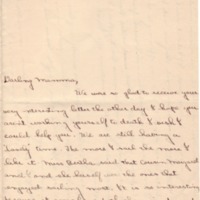 Wilson, Margaret Woodrow, 1886-1944, “Margaret Woodrow Wilson to Ellen Axson Wilson,” 1902 August 16, WWP19535, Eleanor Wilson McAdoo Collection at the University of California-Santa Barbara, Woodrow Wilson Presidential Library & Museum, Staunton, Virginia.